This press release shall not constitute an offer to sell or a solicitation of an offer to purchase any securities in the United States, and shall not constitute an offer, solicitation or sale in any state or jurisdiction in which such an offer, solicitation or sale would be unlawful prior to registration or qualification under the securities laws of any state or country. No securities may be offered or sold in the United States absent registration under the U.S. Securities Act of 1933, as amended (the "Securities Act") or an applicable exemption from registration requirements. No public offering of securities will be made in the United States. This press release is being issued pursuant to and in accordance with Rule 135e under the Securities Act. 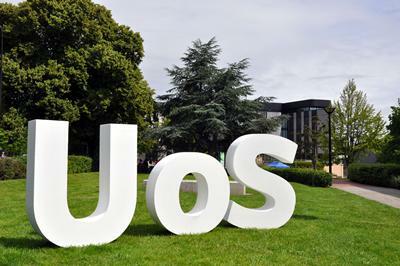 The University of Southampton today announces that it has priced the issue of £300 million 2.25 % bonds due 2057. The bonds have been assigned a rating of Aa2 (negative outlook) by Moody's, and to be formally issued on 11 April 2017. The bonds were priced at a spread of 72 bps over the relevant reference gilt. The University will use the net proceeds from the Bond for general corporate purposes, including investment in research, teaching and IT facilities, as well as other University assets. Barclays, HSBC and Morgan Stanley acted as Joint Bookrunners. Rothschild provided independent debt advice to the University, and Clifford Chance and Mills & Reeve provided joint legal advice. The Bonds are being offered outside the United States by the Joint Bookrunners in accordance with Regulation S under the Securities Act, and may not be offered, sold or delivered within the United States or to, or for the account or benefit of, U.S. persons except pursuant to an exemption from, or in a transaction not subject to, the registration requirements of the Securities Act. Any investment decision made in connection with the Bond issue must be based solely on the information contained in the final Prospectus relating to the Bonds. In connection with the issue of the Bonds, [Barclays] (the Stabilising Manager) (or persons acting on behalf of the Stabilising Manager) may over allot Bonds or effect transactions with a view to supporting the price of the Bonds at a level higher than that which might otherwise prevail. However, there is no assurance that the Stabilising Manager (or persons acting on behalf of the Stabilising Manager) will undertake stabilisation action. Any stabilisation action may begin on or after the date on which adequate public disclosure of the terms of the offer of the Bonds is made and, if begun, may be ended at any time, but it must end no later than the earlier of 30 days after the issue date of the Bonds and 60 days after the date of the allotment of the Bonds. Any stabilisation action or over-allotment must be conducted by the Stabilising Manager (or persons acting on behalf of the Stabilising Manager) in accordance with all applicable laws and rules.